Or do I mean “chateau”? 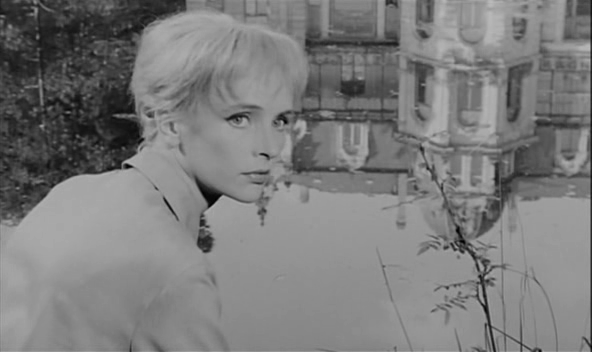 Duvivier time! LA CHAMBRE ARDENTE — THE BURNING COURT — from a novel by John Dickson Carr, master of the locked room mystery — has very little reputation, and it doesn’t quite gel in a plot-character-theme way, but it has some set-piece scenes that are as fine as anything in JD’s oeuvre (French for egg) — a misty nocturnal exhumation; an open casket funeral with guests waltzing round the deceased; an arboreal chase scene. 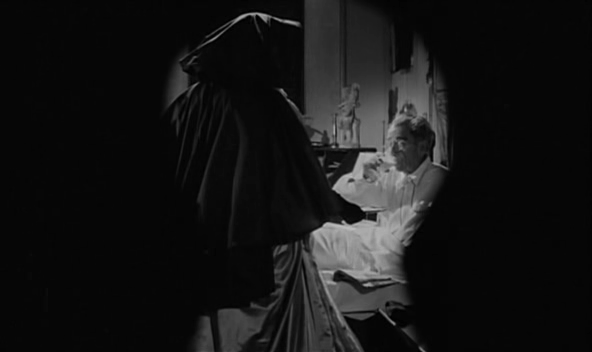 Working with usual collaborator Charles Spaak, JD unpicks much of Carr’s plotting, and the impossible crime at the story’s centre (a figure in period dress is seen administering a fatal glass of eggnog before vanishing through a wall) is actually pretty easy to guess a solution to — but the film’s ending is still a dark surprise. A few characters do seem to be cut adrift by the narrative reworking, with a bland pipe-smoking hero particularly useless to the story. 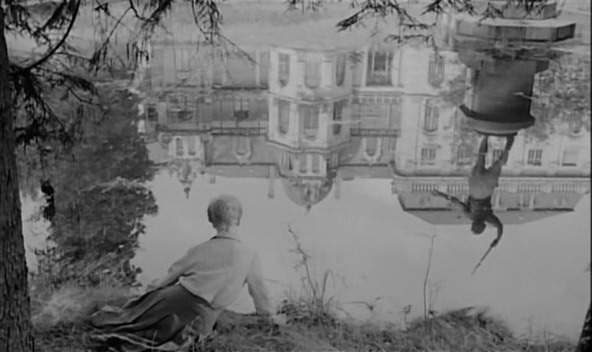 The film this most resembles is Franju’s PLEINS FEUX SUR L’ASSASSIN, with its ancient country house setting, historical murder backstory, hints of the supernatural. 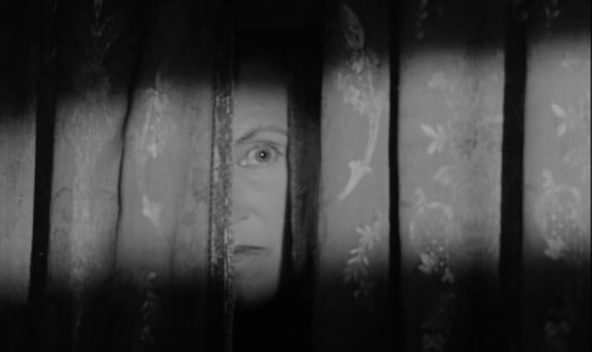 Duvivier even has regular Franju collab Edith Scob on hand, lending her masklike beauty to the eerie going-on, along with the glamorous Nadja Tiller and the always-welcome spannerlike face of Helena Manson, a nasty nurse in Clouzot’s LE CORBEAU. Curious parties are recommended to Carr’s The Hollow Man AKA The Three Coffins, which features two impossible crimes, one of which has a dazzlingly brilliant solution, and also a chapter in which overweight ‘tec Dr. Gideon Fell lays out all the possible solutions to the locked-room genre, simultaneously thrusting the answers to the mysteries at hand under our noses, and whisking them away before we figure things out. In The Sleeping Sphinx, I think it is, a crypt is found where tremendously heavy coffins have been moved about at random, and no footprints mar the smooth sand on the floor. This mystery has little to do with any crime, but it’s fun. In The Judas Window, a luckless hero is found unconscious with a dead man who’s been impaled through the chest by a crossbow bolt, seemingly from a high angle. Locked room. No accessible windows, hidden doors or usable chimney. Although the title is a clue. Can you find the solutions? Everything is as I’ve told you, pretty much, with no secret entrances or supernatural gimmicks.